Students of Carroll County, Maryland local history know Ida, Fannie and Elsie Jones as “the Jones sisters,” or “the Misses Jones,” and remember them as quiet but prolific engines of local culture. This recently-acquired real photo postcard announcing the August 3rd opening of their “photographic studio and rental library” may depict an earlier incarnation of their enterprise, but I can’t be sure without more research. The hand-written card was mailed to “Mrs. Charles Williams, Sykesville, Md.” with a one-cent stamp and postmarked August 2nd, but the year is unreadable; since zip codes were not introduced by the US Postal Service until 1963, it’s possible the card could be from the 1950s. 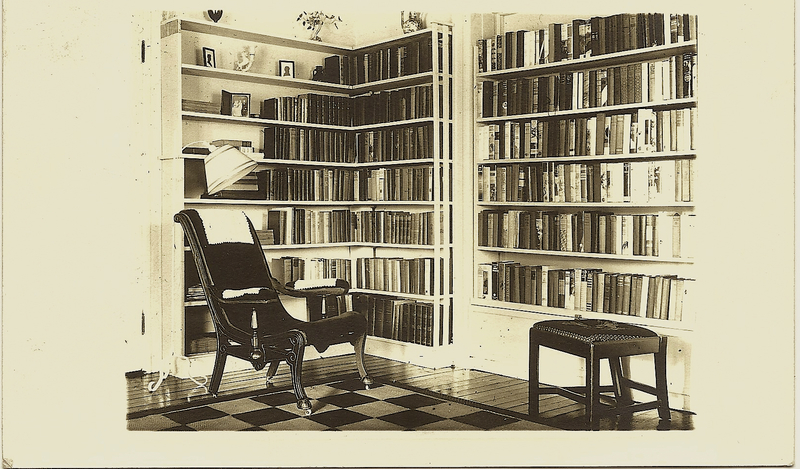 With its simple composition of an old-fashioned arm chair in a book-lined corner ornamented with family mementos, the photograph they created for this postcard announcement reflects a sense that art and literature were part of an ordinary home’s comforts, not something just for special trips to the big city. The sisters worked together for decades on photographic expeditions throughout the state, producing hand-colored photographs of buildings, landscapes and studio still-life compositions, postcards and note cards, as well as hand-made table linens and other needle crafts. According to Mary Ann Ashcraft’s 2007 article in the Carroll County Times, their photographs, on sale at DeVries Hering Hardware Store in Sykesville, were frequently purchased as wedding gifts. Elsie Sluby Jones (1885-1975), Ashcraft relates, bought a Voightlander camera in the 1930s and took the photos. Ida Webb Jones (1882-1967), who graduated from the storied Maryland Institute in 1916, where she won the class prize in the Design Department, did the printing and hand-coloring. Frances Isabelle Jones (1881-1973) was in charge of the housekeeping and driving to the places throughout Maryland that interested them. In 1944, the sisters produced a small printed, comb-bound book they called “Maryland History through the Camera’s Eye.” It was meant to be the first of two volumes, but according to Ashcraft, war-time difficulties procuring quality paper quashed plans for the second volume. Copies of the book appear for sale from time to time on the web; it’s unclear how many were printed in total. I recently acquired a copy in good condition for $30.00. “Maryland History” contains black-and-white prints of homes and other historic sites from all over the state, including Hager’s Mill, in Washington County, Perry Hall in Talbot County, Walnut Grove in Queen Anne’s County, and Carroll County Court House in Westminster, just to name a few of the sites they visited. Based on my own brief research into the Jones family history, the sisters’ grandfather, Thomas Jones (1810-1899) was a carriage-builder in Rock Hall, Kent County, Maryland. He brought his family to Howard County between 1860 and 1870, where the census records his occupation as farmer, and his worth in land and personal property as $12,000. If the information in Lawrence Buckley Thomas‘ 1896 work The Thomas Book is correct, Thomas Jones’ parents may have been David Jones (b. abt. 1780) and Maria Thomas (b. 25 June 1788, Cecil Co., Md.) On the Webb side, the sisters were descended from Maine-born merchant David Burbank and Sophia Andrews Burbank. All three sisters are buried in Springfield Presbyterian Cemetery, Sykesville, along with their parents, Nicholas Sluby Jones (1851-1906) and Julia (Webb) Jones (1856-1932). Update: In late November 2013, Dr. Mark Fraser accepted this postcard as a donation to the Sykesville Gate House Museum, which will become the card’s new and permanent home. Bill Hall’s Sykesville by Arcadia Publishing includes a chapter on the sisters, including reproductions of family photographs and images of the sisters’ works. The Sykesville Gate House Museum of History holds an important collection of Jones sisters work. The Museum has posted on line a brief article about the sisters and six of their images. The the Pratt Library also owns a small but significant collection of Jones sisters work.